Welcome to the Private Peaceful website! 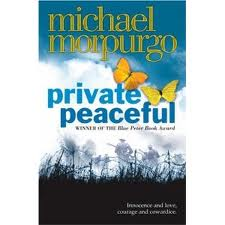 During the course of the coming weeks, you will read Private Peaceful. However, this is not just about reading a story. It's about linking what you have learned in your history class, what you have seen on television, and perhaps even stories that you have heard from older family members. Through this novel, you will come to understand an event that has had a huge impact on British - and world - culture. The way to read this website is as a chapter-by-chapter guide to the story. There is extra information to help you understand the book better, as well as questions that need to be answered. having read the book!) All questions must be answered in full sentences! 3. A self-evaluation of what you have learned (minimum 150 words). Your mark will be a combination of your answers to the questions (50%) and your Further Oral Activity (50%). Content, language and style will be the three elements used as a basis for your portfolio mark, and the Further Oral Activity will be marked according to the IB guidelines (see point 2 above). Now it's time to embrace the story, and enjoy reading! Click on a link below to go to the assignments for various chapters. Only answer the questions once you have finished reading the relevant chapter.